More meat please! Cats are carnivores and need a high protein, meat based diet to thrive. Cat kibble is the standard in providing a healthy, real meat based diet for your cat. Because kibble is dry it can be transported after opening for easy travel, and portions can be left out for cats to eat throughout the day (for the picky eaters that don't live around our busy schedules!). Many dry cat foods are specific diets, like high protein, grain-free, limited ingredient diets, weight control, prescription and more, while some foods target life stages or conditions, like foods that help alleviate excessive hairballs or are formulated for indoor cats only. Let PetFlow make it easy for you to choose the right food for your favorite feline friend. 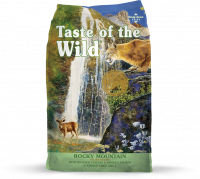 With top rated brands like Orijen, Blue Buffalo, Natural Balance, Merrick, Royal Canin and Taste of the Wild, making sure your cat gets the best possible nutrition for the right price is finally manageable. With hundreds of choices of dry cat food at PetFlow, there's just one thing in common across them all; Meat Rules!